It would be easy to miss Cafe Ma without a local or experienced foreigner to introduce you—this restaurant and bar is nestled in between two car dealerships on the second floor of a hardware store (first floor by the European and Israeli convention). Upon ascending the stairs and entering the restaurant, the atmosphere is surprisingly warmer than one might expect from the surroundings, and it would appear to be at home in any other Western country. In addition to indoor seating, a small room on an enclosed balcony with windows provides room for a few more tables. This restaurant is notable for being one of the minority secular establishments in religious Rehovot. Normally, I don't even think about whether a restaurant is kosher or not, because the food may be delicious regardless. However, being secular enables them to serve a cheeseburger, as well as actual bread during Passover. Until finding Cafe Ma I had considered observing a moment of silence for the absence of the cheeseburger, but then realized that one person observing a moment of silence does not really make a point. I of course had the cheeseburger, preceded by some kind of eggplant appetizer and followed by the pictured dessert. The eggplant was a little overcooked, which generally tends to happen in restaurants, for reasons unknown to me. The cheeseburger had goat cheese and steak fries, with extremely generous portion sizes. If I did my mental metric conversion properly, you can get a burger up to a pound in size, and the smallest size is still quite formidable. The beef was high quality in contrast to other restaurants I've been to in this country. 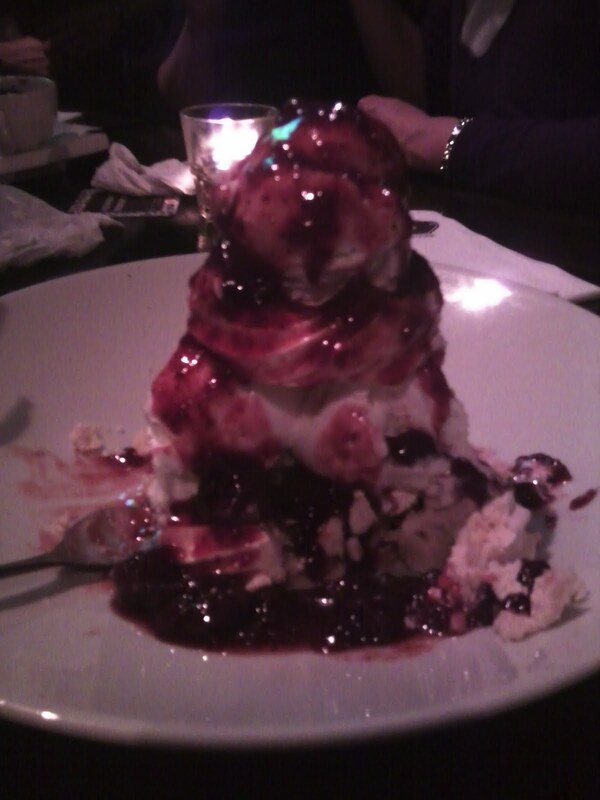 The dessert was as decadent as it looks, with extremely smooth and rich vanilla ice cream, light cookies, and raspberry sauce. It is perhaps best to attack the dessert with the help of one or two others, and it seems bringing a large group of people will lead to a free round of vodka anyway. It's a win-win situation. One cannot really complain about Cafe Ma, other than perhaps for the second-hand smoke—although this is more of a general problem with going out in Israel, and so I can't place the blame entirely on the restaurant itself. The inspiration for their name is also a little bizarre, coming from the Japanese for "gap," with the napkins giving some story about Japanese Noh flutes and general "what is the sound of no hand clapping? "-type nonsense. Apparently, peculiar misinterpretations of Japanese culture know no geographical bounds. All in all, for what you pay, it is easy to leave feeling satisfied, and occasionally it is pleasant to find food that is familiar to my American palate.